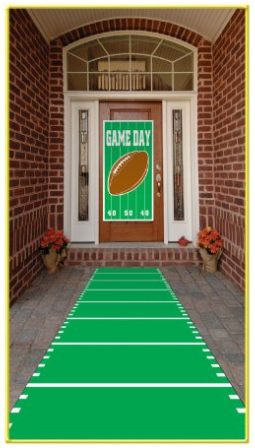 Are you planning a football party, here is a fun treat idea that will have everyone smiling when they see them. My kids thought they were pretty awesome. 1 bag or large marshmallows (about 40 total) or a bag of small marshmallows works too. 1. Melt the butter and marshmallows on medium heat in a large saucepan. Stir until melted. 2. While the butter and the marshmallows are melting, line a 9×13 baking sheet with foil and spray with non­stick cooking spray. 3. Once the butter and marshmallows are melted, pour in the 6 cups of Cocoa Krispies and stir until completely coated. 4. Pour the mixture into the 9×13 baking pan and evenly press down with the back of a spoon or wax paper. 6. Scoop about 1?4 of a cup of white frosting into the small sandwich baggie and snip the cornerwith the pair of kitchen scissors. 7. Gently squeeze the frosting out of the baggie making the football design on each treat. 8. Store covered in an airtight container if not serving immediately. *Makes approximately 20 2­3” size footballs. 1 football treat = 1 serving. 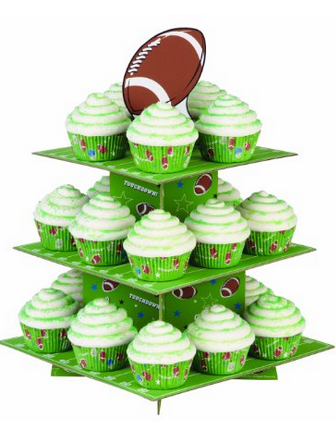 Football Treat Stand only $6.99 Shipped Free. Perfect for you next football party. Next articleFloral Flutter Sleeve Top for $24.99 (was $39.99) 2 days only.